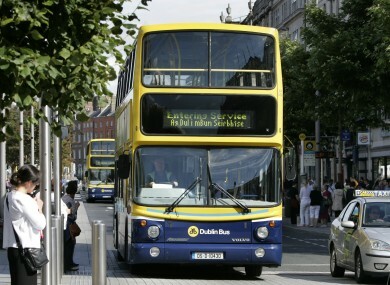 DUBLIN BUS EXPECTS to carry 115 million passengers by the end of the year. The company welcomed the improvement on passenger numbers stating that they expect to have carried an additional 400,000 customers between October and December. In a statement today, the company said that the significant boost in passengers “leaves the company with a solid base for which to grow and build on in 2014″. Dublin Bus said they have begun to recruit for the first time since 2008 and will employ 70 new drivers over the next three months. They added they had added 80 new low floor buses in 2013 “ensuring that the company is now only one of two bus companies in Europe to offer a fully low floor accessible fleet”. Speaking today, Dublin Bus Chief Executive, Paddy Doherty said the increase proves the “effectiveness” of the many of the company’s new developments such as the Network Direct Project and customer service improvements like the Real Time Passenger Information at bus stops and on smartphone apps, as well as on-board Wifi. Email “Dublin Bus to recruit 70 new bus drivers in the coming months”. Feedback on “Dublin Bus to recruit 70 new bus drivers in the coming months”.